A few days ago, I participated in a seminar organised by the Liberal Party of Sweden on the upcoming parliamentary and presidential elections in Russia. The section of the seminar in which I was a speaker was devoted to the question of how the Internet and social networks can help to promote democratic values in Russia. It pleased and heartened me greatly that the issue of the Internet's influence on politics has ceased to be a ‘trivial’ topic, considered until now by very many people a passing fad without any substantial influence on political and public life. Evidently, recent events in the countries of North Africa have forced politicians and public figures to examine more closely the influence that the Internet and social networks have on the formation of public opinion and on civic mobilisation. Indeed, society unified by social networks and online communities is starting to operate in a more organised and effective fashion. People find others who are like-minded on social networks, start to think of themselves as members of a particular, organised community, take part in collective activities and invite their friends. Social networks, without exception, help society to feel like a political actor. In Russia's case, networks also help citizens to overcome the post-Soviet trauma that led to disconnection and atomisation within Russian society. At the same time, we must not consider social networks a universal determinant of civic action. It is a mistake to think that the growth of social networks necessarily leads to revolutionary events such as those in Egypt. The new-found social connectivity of people through networks is important, but only one of the conditions is necessary for social transformation. I would like to recount briefly below my speech at this seminar in Stockholm. Since my main task was to respond to the question of how exactly civic mobilisation can be helped and supported through social networks, I structured my speech as answers to five key questions: “What?”, “How?”, “Who?”, “When?” and, finally, “What is to be done?” What is the status of social networks in Russia today? How do they affect political and public life? Who exerts influence over and acts through the Internet? When can the growth of social networks and connections produce an effect on society? Finally, what is to be done to help the process of public mobilisation via networks? According to the statistics of the Public Opinion Fund [ru], the monthly Internet audience Russia during winter 2011 was 50.3 million people, or 43% of the population over eighteen years of age. The growth in the number of internet users. Statistics: "Public Opinion" fund. Apart from that, the growth dynamic remains consistent, insofar as the number of users continues to grow each year. 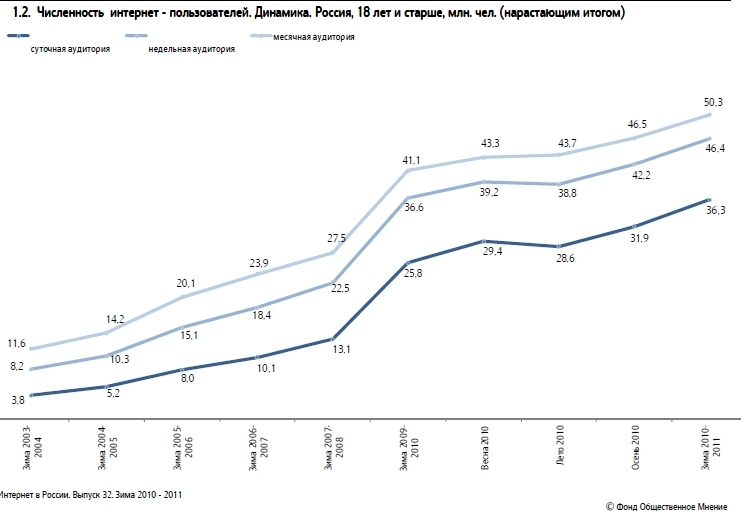 Russian interest in social media is also at a consistently high level. According to the findings of the international project TNS Digital Life 2010 (an online survey of Internet users in 45 countries), 85% of Russian Internet users visit social networks at least once per week. By comparison, roughly just as great a percentage of the Chinese and Brazilian populations (87% and 85% respectively) are frequent visitors to social networks. In Germany and the U.S.A., this figure is considerably lower: 61% and 70% of the population respectively. In discussing the influence of social networks on public life, we must be guided not only by the number of visits but, to a greater extent, by existing experiences and examples of such influence. 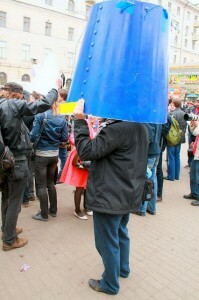 By this criterion, the LiveJournal blogging platform has the greatest influence on the political agenda in Russia. On LiveJournal, public events and occurrences are brought to attention with the help of user-generated ‘blogwaves’ [ru], and the media permanently monitor what is emerging there. If we are talking about potential for mobilisation – that is, the capacity to assemble an informally integrated group under the banner of a particular issue – then the most successful platform at the moment is the social network VKontakte (In Contact). True, it is worth noting that VKontakte can delete a group – of which there are already examples. In the second place in terms of potential for mobilisation I would rank LiveJournal. Other networks – Facebook, Odnoklassniki (Classmates), Moi Mir (My World) and so on – have not succeeded so far, with the exception of certain cases, in becoming instruments of sociopolitical influence. Who are these people who manage to launch ‘blogwaves’ and influence the agenda, as well as resolve emerging problems? Most often, they are the most frequent users. Neither professional journalists nor public or political figures, they are new citizen journalists – people who discover and publish information of public interest on their blogs. Due to re-posting and links from a large number of bloggers, as well as support of particularly popular bloggers and media, an issue can very quickly attract a lot of attention and become popular. One such example occurred recently, when the driver of the head of Russia's Ministry of Emergency Situations, Sergey Shoygu, threatened to kill the blogger archeornis who recounted the story on the LiveJournal page of the Society of Blue Buckets and also uploaded a video. As far as potential for mobilisation is concerned, we almost always see a similar phenomenon here: the organisers and initiators of civic groups on social networks are more often than not ordinary people, not members of any particular party or organisation. A classic example of this is a VKontakte group called Informal Public Association – Healthcare for Children! [ru], which was created by Daria Makarova, a young mother from Novosibirsk who lost her child. The goal of this group is to promote changes in the area of children's healthcare in the Novosibirsk region. Within a few months of existence, six thousand people had already joined. This group is leading an active campaign: holding meetings with the directors of Novosibirsk's healthcare system, employing experts, monitoring the condition and requirements of the region's children's hospitals, and carrying out fundraising activities. The leaders of social networks’ communities and groups are a new kind of public figures, emerging directly from within civic society. Practically anybody with a desire to act, the energy to gather supporters, and basic social networking skills can become one of these new leaders. New groups such as these are not required to register with the Ministry of Justice – a feat that is currently almost impossible for new parties or public organisations. Online groups do not require an office, support staff, etc. All their funds, which they can easily raise via the Internet, are spent on concrete action. As well as these pluses, there are some minuses. Existing on a network, informal organisations are less stable and can quickly cease to exist since they are based not on formalised structures but on the efforts of their members and organisers. What effect can the rapid development of social networks, the growth of the number of users, and the strengthening of their capacity for social impact and mobilisation have, and when? In regards to internet users in Russia, the Public Opinion Fund predicts that by the end of 2014 (assuming present trends in the growth and spread of the Internet continue), they will number around 80 million, or 71% of the population over eighteen years of age. In turn, according to the estimates of J’son & Partners Consulting [ru], the share of the Internet audience using social networks will reach on average 76.5% of the total number of Internet users by the end of 2015. Furthermore, by 2013-2014, ‘blogwaves’ will develop and become more widespread and effective. The growth in the number of users sooner or later will yield a qualitative effect, that is, in terms of the impact of blogs on the authorities and society as well as the potential for mobilisation via the Internet. People will be used to interacting via the net, they will see the advantages and feel the zest for life in online communities, and they will take part more often in the activities and operations of such groups. Social networks will help Russian civic society get on its feet and develop a new quality: society will be structured not by parties and public bodies but by informal network communities involving a greater number of participants. Training citizen journalists so that there is an increase in the number of people who independently find and publish information of public interest on blogs and social networks. Furthermore, helping and supporting these citizen journalists. Supporting new networks and communities involved in areas of public interest (bearing in mind not only politics but issues related to the defence of civil liberties in various spheres: corruption, the army, protection of historical monuments, lawlessness on the roads, environment, healthcare, etc.). I will underline one important point: such support requires new people, new leaders who must be sought not in pre-existing organisations but in new media and network communities. Yes, of course, the advantage of online communities is the lack of registration, bank accounts and offices – all things that cause problems even for international institutes that are used to interacting with legal entities. But this problem is easily resolved if the emphasis is placed on specific people: citizen journalists and social leaders, who would benefit from training, an exchange of experiences and the expansion of connections. To sum up, I want again to underline that the development of social networks and civic mobilisation in Russia has a very marked and positive effect on civic society and Russian political life in general.